Whatever your situation, or whims and fancies, it’s decided, you are moving from Hobart to Darwin next few weeks. In fact, you have already bought or rented a new house or apartment in Darwin and taken care of your children’s school admissions, accepted an offer from your new office (or at least have a few interviews scheduled in offices in Darwin). In short, you are all set, except, there’s one problem – moving your home with Hobart to Darwin removalists to your new house! Yes…interstate moving can be a problem, especially moving all that furniture over several thousand miles to Darwin. The worse you can do is not plan ahead and leave all your packing till the last week before moving, hire just any truck service to transport your furniture to your new home, and pay a paltry sum for ‘cheap’ furniture removals services which ultimately does more damage to your precious belongings, than good. Roadways Furniture Removalists to the Rescue! Let’s face it, 99% of the general population, no matter how rarely they move house, never get new furniture made and installed in their new houses or apartments. It’s just too expensive! Besides, there’s always too much sentiment involved; your baby first learned to stand holding that wooden chair, you bought that love couch on your first anniversary, etc. Understandably, you don’t want to sell off or give away your furniture. How to move your furniture to Darwin? The solution: look for a reliable interstate moving company to take care of the packing and transportation of your furniture. Roadways Furniture Removals is one of Australia’s most reliable and favoured interstate removalists, helping clients move intrastate and interstate. We offer professional moving services that are matchless in terms of quality and prices. Our interstate removals services guarantee you a hassle-free interstate relocation and complete peace of mind. Don’t go chasing “cheap” furniture removals companies. Choose Roadways instead; we offer affordable services without causing a dent in your pocket, and provide top-quality, trustworthy and safe interstate removals. Our knowledgeable and experienced team of packers, movers and drivers ensure your furniture reaches its destination in Darwin, undamaged and in good condition. Best Hobart to Darwin Removalists. 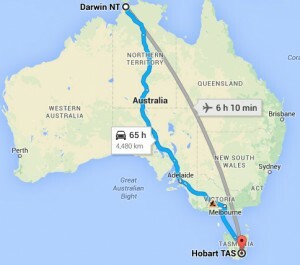 If you need reliable Hobart to Darwin removalists, Roadways Removals is ready to get the whole process on the way today!